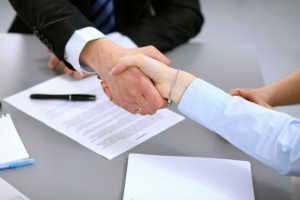 What is a Definitive Purchase Agreement? A Definitive Purchase Agreement (DPA) is a legal document that records the terms and conditions between two companies that enter into an agreement for a mergerAmalgamationAmalgamation is the combination of two or more companies, known as a consolidation. In accounting an amalgamation, or consolidation, refers to the combination of financial statements. For example, a group of companies reports their financials on a consolidated basis, acquisitionMergers Acquisitions M&A ProcessThis guide takes you through all the steps in the M&A process. Learn how mergers and acquisitions and deals are completed. In this guide, we'll outline the acquisition process from start to finish, the various types of acquirers (strategic vs. financial buys), the importance of synergies, and transaction costs, divestitureDivestitureA divestiture (or divestment) is the disposal of company's assets or a business unit through a sale, exchange, closure, or bankruptcy. A partial or full disposal can happen, depending on the reason why management opted to sell or liquidate its business’ resources. Examples of divestitures include selling intellectual, joint venture or some form of strategic alliance. It is a mutually binding contract between the buyer and seller and includes terms and conditions such as asset purchased, purchase consideration, representations and warranties, closing conditions, etc. A Definitive Purchase Agreement is used as a document to transfer the ownership of a company. The agreement also contains schedules or annexures describing the inventory list, key employees, tangible assetsMonetary AssetsMonetary assets are assets that carry a fixed value in terms of currency units (e.g., Dollars, Euros, Yen). They are stated as a fixed value in dollar terms even when macroeconomic factors such as inflation decrease the purchasing power of the currency., net working capital determination, etc. In an Asset Purchase Agreement, the individual assets are transferred from the seller to the buyer, rather than the entire company. The seller remains the owner of the entity and the buyer merges the assets into his existing company or forms a new company with those assets. Definition of Key Terms – The agreement will define the key terms and their meanings for the entire document. It will describe how the buyer and seller are referred to in the document, the meaning of the closing date, sufficient working capital, etc. Purchase Consideration describes the aggregate consideration the buyer is liable to pay to the seller. It also discusses the adjustments that are required to be made in the purchase price. It provides a complete detail of the timelines of payment after the closing date and specifically contains the earnest money that is deposited in the escrow account, earn-outs, third-party financing, required working capital at the time of closing, etc. In this section, both the buyer and seller need to state true facts that are referred to as “representations” and then “warrant” that the statements are true. Also referred to as “Reps and Warranties,” they are one of the most important and longest parts of the agreement and hence, are negotiated very extensively. The goal of the buyer is to get comprehensive representations and warranties as they provide a valuable source of information on what the buyer is paying money for while on the other hand, the seller’s objective is to limit the reps and warranties for the same. A typical warranty will be that the seller is in compliance with government regulations, the Worker’s Compensation Act, intellectual property laws, the seller has the legal authority to sign the agreement, etc. Duration – It may make a representation or warranty until a particular time and hence, won’t be responsible for any occurrence past that period. Materiality – It may qualify a representation or warranty by defining what is material and what might cause an adverse material impact. Scope – A possibility is to limit the scope to what was provided in the data room during the transaction process. Disclosure Schedules – It may also limit reps and warranties with reference to the information provided in the disclosure schedules. Solicitation – This section deals with the possibility of the seller looking for other buyers. There are some popular terms that are included in the agreement as to convey the true meaning for both the parties. No-Shop – This clause restricts the seller from looking for other buyers in the market. The inclusion of this clause is beneficial to the buyer as no buyer would like to get outbid by other potential acquirers. Go-Shop – This clause allows the seller to actively look for better bids than the current one. This clause may be used when the seller is not getting the desired price that it is looking for. The inclusion of this clause is not good from a buyer’s perspective. Sandbagging Clause – This clause is buyer friendly as it allows the buyer to bring an indemnity claim based on breaches even if they were known prior to closing. The seller tries to limit the buyer’s remedies based on pre-existing knowledge of an inaccuracy or breach. Survival – Indemnification clause is not for perpetuity. This provision provides an expiration time for indemnification claims made under the reps and warranties section. The period of survival ranges from 12-24 months. Type of Damages – Parties negotiate extensively the kind of damages that can be recovered under the definition of “Damages” or “Losses.” The buyer by default would like this clause to be as broad as possible and will want to cover punitive damages, while the seller would want to explicitly exclude punitive, consequential and similar damages, and may look to also exclude diminution in value damages. Baskets & Deductibles – Baskets and deductibles are clauses that are designed to provide an assurance to the seller that for immaterial claims, the seller will not be approached and involved. In case of baskets, the seller is liable to pay the total loss of the buyer only if the buyer’s loss is more than the amount agreed in the basket. For example, if the basket amount is $100,000, and the buyer’s loss is $70,000, the seller does not need to pay the buyer. On the other hand, if the total loss of the buyer is $120,000, the seller needs to pay the entire amount. However, in case of deductible provisions, the seller is liable to pay only for the excess loss above the deductible amount. Generally, a combination of both these is used in the agreement. Cap – Allows setting a maximum limit to the seller’s indemnification obligation. It can be set either as a percentage of the transaction value or a specific dollar amount. Ideally, the seller would like to have a cap and would like it to be as low as possible, whereas the buyer would not prefer a cap, as it will put a limitation, or will try to increase the size of the cap by negotiating. Generally, there is a time gap between the signing of the agreement and the closing of the deal as certain regulatory approval is required. With such a time gap, there are certain conditions from both parties that must be met for a successful closing of the deal. If certain conditions are not met, then the other party is not required to close the transaction. Buyer should ask for reps and warranties to be accurate as of the signing, as well as of the closing date. Buyer and seller can also negotiate how accurate the reps and warranties need to be, as all reps can’t be standardized. Material Adverse Effect is something that is significant for determining whether the conditions to closing are satisfied or not. Inventory – It mentions the inventory the seller needs to have at the time of closing and the necessary adjustments that can be made in the valuation in case of any alteration. A detailed description of the inventory is also included as annexures. Dispute Resolution – In case of any dispute between the parties, the companies should try to resolve these through discussion. However, in case they are not able to do so, the agreement shall be governed by applicable laws. Termination Fees – This clause is inserted to penalize the seller or buyer if the deal falls apart at the last moment because of either party changing its mind. It is generally in the range of 2%-3% of the Enterprise Value. Finder’s Fees – It clearly mentions who pays the fees to the banker appointed for the process. Generally, each party pays fees to the advisor they appoint. The Definitive Purchase Agreement also includes annexures, which can include the Key Employee Agreement, Fixed Asset, Escrow Agreement, IP Agreement, Net Working Capital Determination Methodology, etc. Confidentiality Agreements in Investment BankingConfidentiality Agreements in Investment BankingWhy banks try to avoid Confidentiality Agreements. Whenever possible, investment bankers should avoid entering into a confidentiality agreement as a condition of receiving confidential information, particularly prior to obtaining a signed engagement letter.